Having read all the recent articles about how sugar is the devil and we must all give it up immediately, I started thinking about the amount of sugar I consume, and how much the children eat. Not only is it bad for their health (as sugar-laden foods tend to be low in nutrients in general), it’s so bad for their teeth. I am aware that when checking your diet for ‘hidden sugar’ breakfast cereal is often the culprit, and I will admit that my kids do often eat Cheerios (or the own-brand equivalent), Special K (ditto) and granola, which I know are high in sugar. I am no saint! However, I do put my foot down when it comes to chocolatey cereals and Frosties. I console myself with the fact that every morning they also eat fresh fruit, wholemeal toast or ricecakes with homemade jam or peanut butter (the no-sugar variety) and in my book, this cancels out the evil cereal. And often, in fact, they will forego the cereal for porridge or scrambled eggs, which they adore. Whatever they eat, they brush their teeth pretty well afterwards. I never buy fruit juice because it’s high in fructose, or fruit sugar (read Zoe Harcombe’s website if you’re interested in the effect of fructose on the body) and so they drink milk or water. I also never buy fruit yogurts because they are invariably laden with extra sugar. 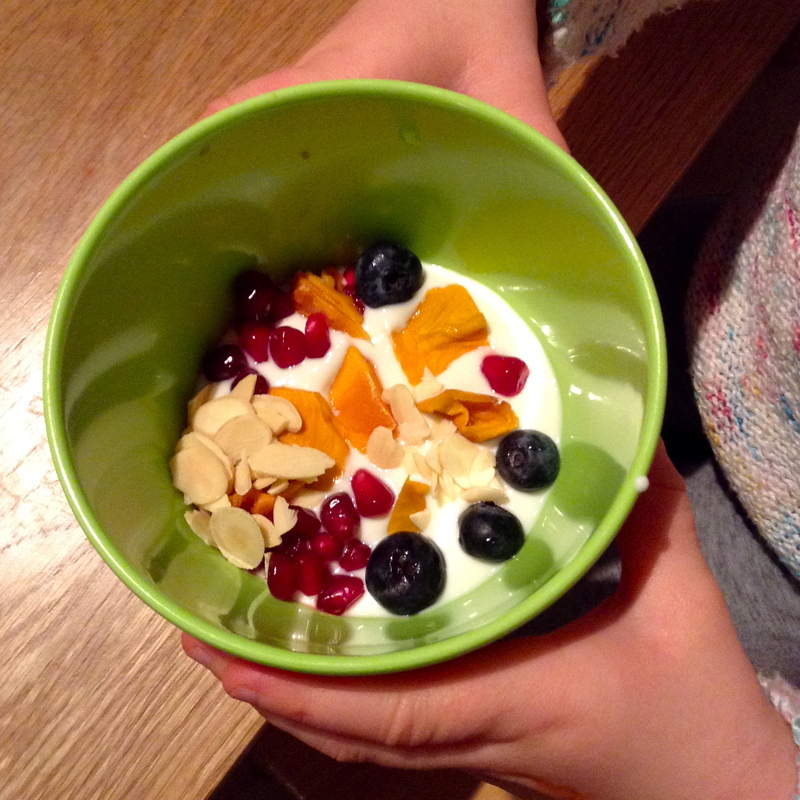 When it comes to yogurt, from a very young age I only really gave the littles plain (natural) full-fat yogurt with a variety of toppings – yes, fruit, but also (tiny) swirls of honey, nuts and homemade compotes. I like knowing what they are eating. Without coming over all righteous mum I would simply never buy a children’s-character-branded yogurt or fromage frais. The second ingredient in the Peppa Pig fromage frais is sugar. Each tiny 45g pot contains approx. 1½ teaspoons of the stuff. Not an insignificant amount. So if you are interested weaning your child off sweetened yogurts, or indeed weaning your baby onto plain yogurt, I thought it would be nice to suggest a few yogurt toppings. 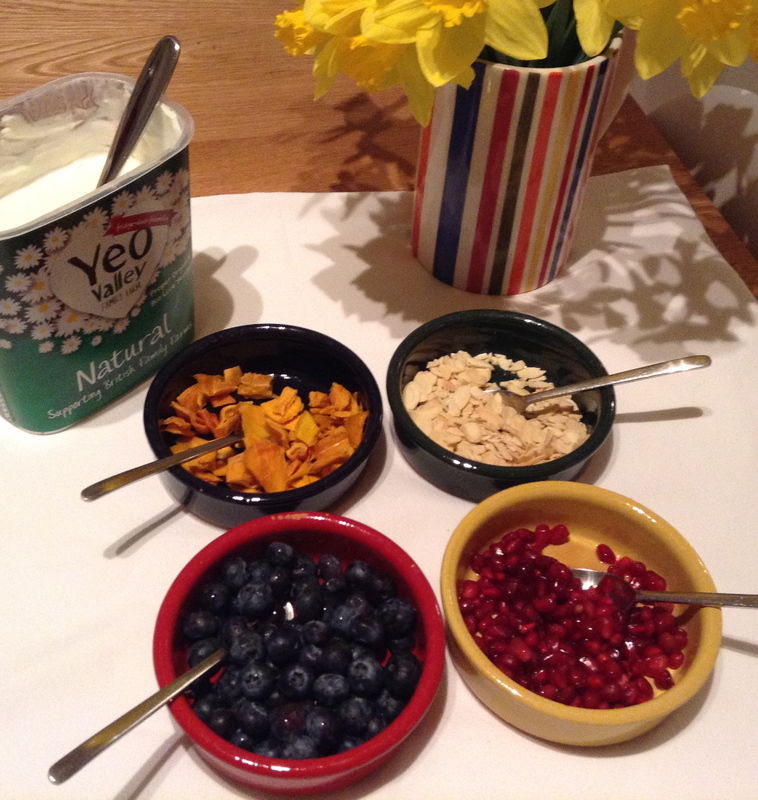 The best plain, natural yogurt is Yeo Valley, in my opinion, and I have tried them all. Sainsbury’s and Waitrose do a good own-brand Greek yogurt. Personally, I find Rachel’s and Total a bit chalky. I asked food writer and author Bee Wilson, who recently wrote a piece about Greek yogurt in Stella magazine, about how she likes to eat yogurt, and she told me she once visited a primary school where they had yogurt toppings on offer – dried fruit, fresh fruit, compote and so on, rather like an ice-cream bar, so you could jazz up your yogurt, which is such a lovely, healthy image. Her favourite yogurt is whole milk yogurt, topped with blackcurrant jam, a dash of double cream and a sprinkling of toasted pumpkin seeds. Sounds utterly divine! With the ice-cream bar image in my mind, rather than simply plonking some cut-up banana on top of the kids’ pudding at tea-time tonight, I presented them with bowls of yogurt and a colourful ‘yogurt bar’, with pomegranate seeds, blueberries, toasted flaked almonds (I didn’t toast ‘em, Waitrose did) and cut-up dried mango. They absolutely LOVED it, and merrily sprinkled and chatted and devoured their pudding. Make healthy food fun for kids and everyone enjoys the experience! Pick a topping from The One-Handed Cook’s ‘yogurt bar’! Have fun topping your yogurts!